On the strength of its long experience in timing, Longines has designed a timepiece that pays tribute to the various timing mechanisms developed during the company’s history. Named the Longines Column-Wheel Chronograph, this model houses a brand new calibre whose exclusive development by ETA was mandated and financed by Longines and other brands within the Swatch Group. This self-winding, chronograph movement has a column wheel which drives the mechanism that measures periods of time – a technical device used by the famous St. Imier brand since 1878. Longines started manufacturing timing equipment in 1878 with the launch of a simple 20 line chronograph; reference number 20H, that had a column wheel (covered by a washer) that governed the chronograph mechanism. Following Longines’ progression into the field of timing, almost all the measuring equipment devised by the company used this same principle. Both calibres for pocket chronographs made by Longines, such as the 19CH (1889), the 19.73 (1887), the 19.73N (1909) and the 19.73N with a split-seconds function (1922), the 18.72 (1929) or the 24 line calibre intended specifically for sports timing (1939) and movements for the brand’s wrist-chronographs, such as the 13.33Z (1913), the famous 13ZN (1946) or the 30CH (1947) thus all incorporated column-wheel systems for controlling and activating the chronograph functions, which varied according to the specific calibre. This collection of timing equipment formed the foundation for Longines’ history of involvement in timing and the world of sport. 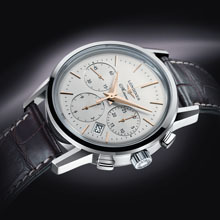 The mechanical, column-wheel chronograph thus became a traditional and authentic technical device at Longines. 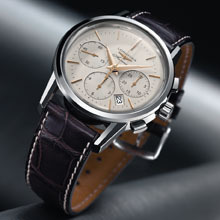 The new Longines Column-Wheel Chronograph model continues this horological heritage into the 21st century. Having identified the modifications that have affected the world of mechanical timepieces over the past few years (a marked demand for high-quality mechanical watches, the popularity of mechanical chronographs and a fascination for traditional horological devices among the general public), Longines and other brands within the Swatch Group mandated and financed the exclusive development of a self-winding movement with a column wheel for a wrist-chronograph which has now been produced by ETA. This calibre is a contemporary embodiment of a long tradition of mechanical timing which is Longines’ heritage. 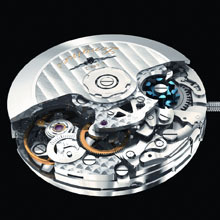 Fitted with 27 jewels, the L688.2 movement is a self-winding calibre with a diameter of 30 mm and a height of 7.90 mm. The blued steel column wheel controls the chronograph functions (start, stop, return to zero) and is part of a work of art that is a stylish update of a traditional technique. Beyond its sleek design, the L688.2 calibre is an inspiring creation designed specifically to meet the demands of timing. To house this brand-new, exclusive movement the watchmaker has chosen classical and elegant lines that are reminiscent of the timepieces that contributed to its success during the 20th century. The Longines Column-Wheel Chronograph has a stainless steel case with a diameter of 40 mm that houses the L688.2 calibre whose intricate workings can be admired through the transparent case back. The gold-plated Dauphine-style hands are mounted on top of a silvered dial featuring, gold-plated applied hour symbols, a small seconds at 9 o’clock, a 30-minute continuous action counter at 3 o’clock and a 12-hour continuous action counter at 6 o’clock. The timing features of the Longines Column-Wheel Chronograph combined with a classical design make this model a contemporary watch that echoes the great tradition of mechanical timing.